One man stood tall in the ruins of Zimbabwe’s 218 run defeat against Bangladesh at Dhaka on Thursday - Brendan Taylor. While Zimbabwe have struggled in recent years to find truly world class performers, Taylor showed once again why he can claim a place among the best in the world. 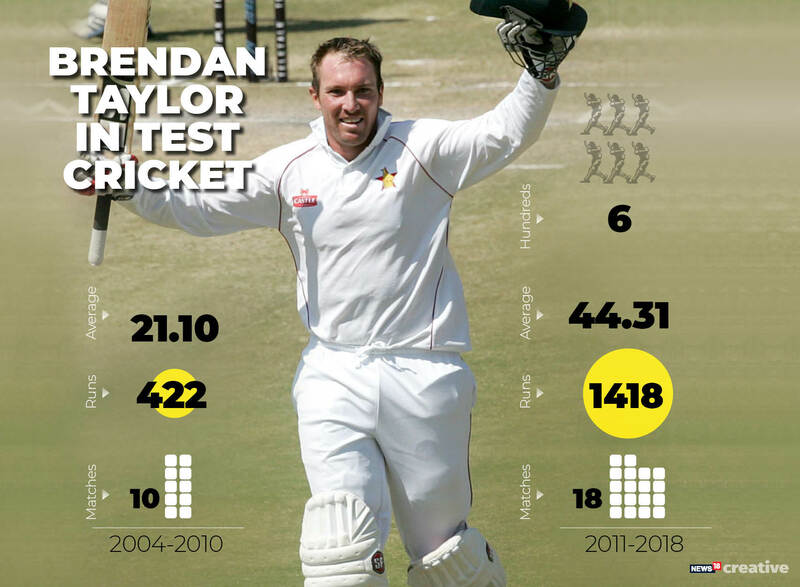 Taylor registered a hundred in both the innings – a feat he has now achieved twice in his career (Andy Flower and Grant Flower are the other two Zimbabwean batsmen to register hundreds in each innings of a Test). He also became the first from his country to achieve the feat outside home (both the Flower brothers did it in Harare). He also joined an exclusive list – which includes the likes of Bob Simpson, Brian Lara, Jacques Kallis and Hashim Amla, amongst other greats – to become the tenth visiting batsman to score a hundred in both innings of a Test in Asia. Statistically, Taylor is a Zimbabwean giant. He equalled Andy Flower’s record of the highest number of international hundreds by a Zimbabwe batsman (16) when he registered his second-innings hundred against Bangladesh in Dhaka. 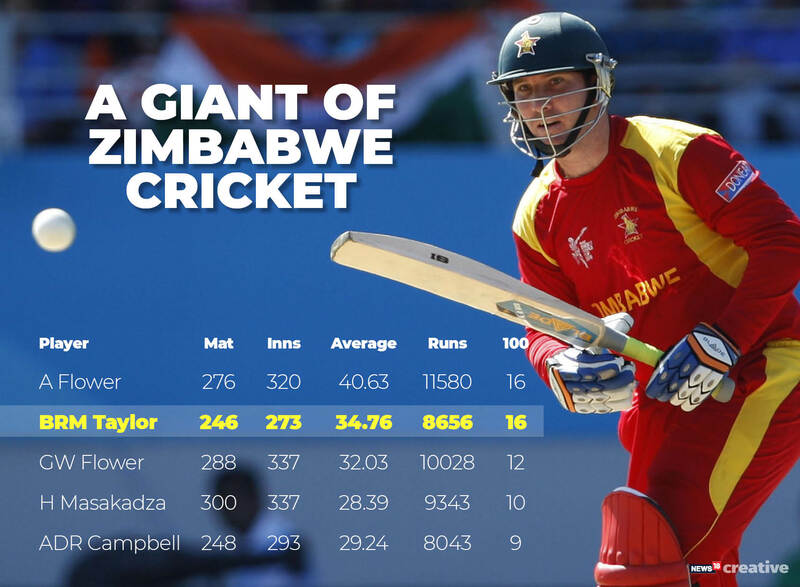 Only three batsmen – The Flower brothers and Hamilton Masakadza have aggregated more across formats than Taylor. Only the Flower brothers have more 50 plus scores (Andy – 98, Grant – 67) than Taylor (65). His consolidated batting average of 34.76 is also the second-highest after Andy Flower (40.63) in Zimbabwe’s cricketing history. It is higher than the likes of Houghton, Johnson, Goodwin and Grant Flower amongst others. However, Taylor’s cricketing journey has been anything but smooth – along with some highs there have been some terrible lows – some for personal reasons, some circumstantial and some even political – such has been the state of Zimbabwe cricket in the last decade and a half. It wasn’t an easy start. Taylor made his debut at 18 in 2004 during a period of cricketing turmoil in Zimbabwe. There was a mass exodus of their top players who were protesting against Zimbabwe Cricket and the corrupt Robert Mugabe government. With several stars making themselves unavailable, it was the lowest point in Zimbabwe’s cricketing history. They had to keep themselves relevant for the next few years and Taylor played a central role – both on and off the field. Taylor led Zimbabwe to a thrilling two-wicket win against Bangladesh in the third ODI in Harare in 2006 – needing five of the last ball, he smashed Mortaza for a six scoring 17 off the final over – and remained unbeaten on 79 in just 72 deliveries. His other standout performance during this period came in the World T20 against Australia in Cape Town when playing in just his second T20 international, Taylor, top-scored for Zimbabwe scoring an unbeaten 60 in just 45 deliveries. Opening the innings, he anchored the chase brilliantly, even as wickets fell around him, and helped Zimbabwe overhaul Australia’s 138 of the penultimate ball of the match. But performances like these were far and few between and were interspersed with periods of friction with the Board. Taylor went to play club cricket in the Netherlands in 2007 and then joined the Lashings World XI in England in 2008 – this raised tension with the administration. Zimbabwe’s Test exile meant that Taylor’s ten matches between 2004-05 were the only Tests he played till 2011. His numbers were quite ordinary – 422 runs at an average of 21.10 and no hundreds. Although a regular feature in the ODI side, his numbers in the format were also quite middling till the end of 2009. In 88 innings, he had aggregated 2399 runs at an average of 29.98 and strike rate of 66.19 – again with no hundreds. Taylor smashed an unbeaten 118 in just 125 deliveries against Bangladesh in Chittagong in 2009. He scored more than half of his team’s total of 221. Although Zimbabwe went on to lose the match by one wicket, this innings transformed Taylor. Hereafter, Taylor has scored 3757 runs in 99 innings at an average of 40.83 and strike rate of 84.21 in ODI cricket. All his 10 ODI hundreds have come in this period. No Zimbabwe batsman has aggregated more in this period. No one has a higher average either. No one has come close to matching his number of hundreds – Sikandar Raza is second on the list with three. His numbers in this period are comparable with some of the best names in international cricket. His average places him amongst the 20 highest in the world (min. 80 innings) during this period. He has a better average than the likes of Morgan, Miller, Duminy, Finch, McCullum, Bell, Buttler and Jayawardene amongst others. Only 15 batsmen have scored more hundreds in ODI cricket than Taylor in this period. His other highlights during this period include an unbeaten 145 against South Africa in Bloemfontein in 2010 – where he carried his bat opening the innings and was again the sole performer in the side (next-highest score in the innings was 30). He had a decent World Cup in 2011 with a 57-ball 44 against New Zealand and a 72-ball 80 against Sri Lanka being his stand out performances. Taylor was handed captaincy post the team’s debacle in the 2011 World Cup. This brought out the best in his batting too. He led Zimbabwe to a famous 130-run win over Bangladesh on their return to Test cricket in Harare in 2011. Taylor scored 71 and an unbeaten 105. Hereafter, in 18 Tests, Taylor has aggregated 1418 runs at an impressive average of 44.31, including six hundreds. Only Masakadza has scored more for Zimbabwe – 20 more runs but in 10 more innings. No team-mate comes close to Taylor’s average in this period – the second-highest is Peter Moor with 35.53. And no one has scored more hundreds either. Taylor was at the peak of his batting prowess when New Zealand toured in 2011. He was the highest scorer of the ODI series with 310 runs in 3 matches – including two back to back hundreds. He was adjudged the Man of the Series although Zimbabwe ended on the losing side. His 117 in 147 balls (only the second Zimbabwe batsman to score a fourth-innings hundred after Kevin Arnott; feat has been repeated two more times – by Masakadza and again by Taylor himself) almost pulled off a remarkable win against New Zealand in Bulawayo in November that year. Chasing 366 for victory, Taylor was the fourth wicket to fall with the score on 265. The lower order wasn’t good enough and Zimbabwe fell short by 34 runs. Taylor was at his best in 2011. He scored 1172 runs in 27 innings across formats. His average of 50.95 was the third-highest in the world (min. 20 innings) after Cook (63.62) and Misbah (58.48). He produced one of his finest T20 innings for Zimbabwe in 2012 when he blasted 75 in just 43 deliveries, albeit in a losing cause, against New Zealand in Hamilton. Taylor became the third Zimbabwe batsman to score a century in both innings of a Test (171 and 102 not out) as he led his team to a massive 335 run victory over Bangladesh in Harare in 2013. Five months later, he led Zimbabwe to the most significant win in their Test cricket history – against Pakistan in Harare in 2013 – a win without the super stars in the middle of financial instability with players threatening to boycott the series. Taylor was amongst the best batsmen in the 2015 World Cup. He aggregated 433 runs in 6 innings with two hundreds and a fifty. His runs came at an average of 72.16 and strike rate of 106.91. Only Guptill, Sangakkara and AB scored more runs than him. But unhappy with the administration, he retired from international cricket after his brilliant 138 in just 110 deliveries against India in Auckland – Zimbabwe’s last group match in the tournament. After a hiatus of more than two and a half years, Taylor returned to play for Zimbabwe – against West Indies in October 2017. He has scored 898 runs in 21 ODI innings in 2018 at an average of 42.76 and strike rate of 87.60. Only Kohli, Rohit, Bairstow and Root have scored more runs than Taylor in ODI cricket this year. 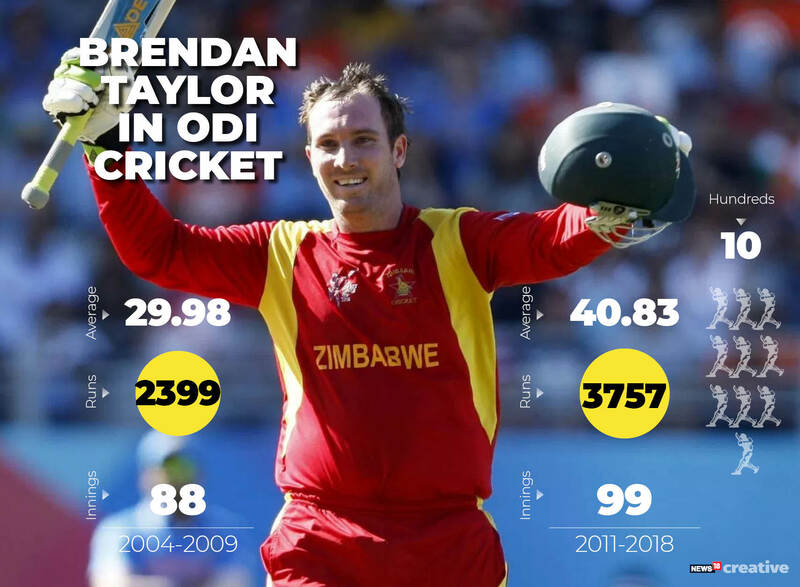 Taylor has been the pivot in the batting line-up, one of the senior-most batsman, who has led by example and is responsible for the resurrection of Zimbabwe between 2011 and 2015 – for the most of which he was the captain in at least one format. His captaincy brought out the best in him. It took his batting to new heights – in both Test and ODI cricket. Add to that his wicket-keeping credentials – and he has been a genuine all-rounder for Zimbabwe. Taylor’s role off the field has also been crucial and almost as critical as his performances on it. He has played a leading role in unifying the players in their battles with the administration – over salaries and the creation of a player’s union – despite being himself surrounded by controversy, tiffs with the board and predicaments almost throughout his career. His dedication to play for his country despite all odds, to keep fighting and never give up for 14 years – 14 years when there have been no superstars for support, when individual brilliance has still not met with the desired results for a weak team and for the most part when the administration has been at loggerheads with the players – to still motivate himself and produce the results he has in the last 8-9 years – it has been a colossal achievement and contribution to Zimbabwe cricket. He continues to serve as an inspiration for thousands of budding cricketers in his country.